Chase Cameron Utley (born December 17, 1978) is a Major League Baseball second baseman who played most of his 16 year career for the Philadelphia Phillies. In August of 2015, he agreed to be traded to the L.A. Dodgers in the midst of a heated pennant race. On July 13, 2018, Utley announced his intention to retire after the season. Batting left-handed, but fielding right-handed, Chase was a product of the Phillies' farm system, having played with the Batavia Muckdogs (A-Short Season) in 2000, the Clearwater Phillies (A, now the Clearwater Threshers) in 2003, and the Scranton/Wilkes-Barre Red Barons (AAA) in 2002-03. 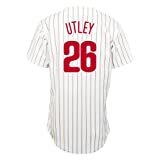 Although Utley mainly played second base during his time in the minor leagues, the Phillies organization attempted to convert him into a third baseman in order to bring him through the winter faster. Consequently, he spent most of the 2002 season at third base, returning to second at spring training in 2001. From 2005-2008, Chase ran off four 100 RBI seasons. In 2009, he came close with 93. Below are his stats for his four hundred RBI seasons. For his career stats, click here. 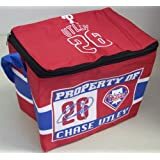 Featured here are Chase Utley posters, photos, giant collectibles and apparel.